Eating sugar results in robbing the body of its thiamine, a B complex vitamin needed for a healthy nervous system and in the digestion of carbohydrates. Refined white sugar is the product that remains after all the B vitamins and minerals have been removed from molasses. 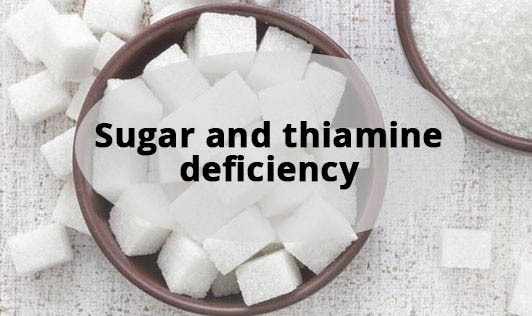 When you eat white sugar in beverages, cakes, sweets, ice creams and soft drinks, large quantities of sugar have to be digested but there is no thiamine or other B vitamins to aid in the process. In order to handle this sugar, the body must steal thiamine from other processes and from its storage places in the liver, kidney and heart. For this reason, it is healthier to keep the sugar intake to less than 2-3 teaspoons per day.